This has been a very eventful week when it comes to – my favorite thing – FOOD! Therefore, you can say it’s been a great week. To make things even better, work has continued to be busy making the days fly by. And not the “oh my gosh I’m so stressed I can’t even breath” kind of busy, but the good kind of busy. A couple Sugar Free Red Bulls may have helped too. Let’s get back to my first thought though – the food! Greg’s aunt was in town and invited us to dinner at S.N.O.B. (Slightly North of Broad), which is a very well-known restaurant in Charleston. I had somehow never been there before and was so excited to finally check it off my Charleston restaurant bucket list. We started with some appetizers to share – a delicious fruit and cheese plate and chilled shrimp. We were also given a bread basket for the table with both cornbread and a traditional white baguette. 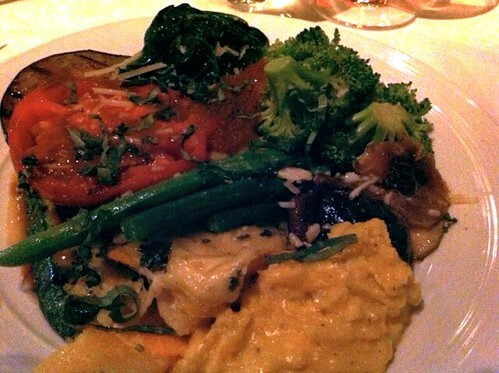 When it came to my entree, I kept things simple with the Vegetable Plate. While this can seem like a boring choice, it was not boring in variety or flavor. My plate was filled with steamed spinach, zucchini, tomatoes, lima beans, green beans, mushrooms, broccoli, a few cuts of cheese, and a small scoop of grits. It could not have been more perfect. I had asked the waitress how the dish was prepared, because I wanted to avoid having a plate of super oily veggies. She told me some were steamed and others were sauteed in chicken broth. I loved that idea! I can’t be the only one that has never thought of that, right?? I’m so excited to implement that new-to-me cooking method. I finally made it to Mi Xao this week as well, thanks to Christina’s recommendations. It is a relatively new Vietnamese restaurant in Mount Pleasant with the cutest little dining area. Greg and I split an order of the spring rolls, which was a great decision. They were awesome on their own, but also came with the best little citrusy dipping sauce ever. Greg had a traditional chicken stir fry with brown rice as his main dish. 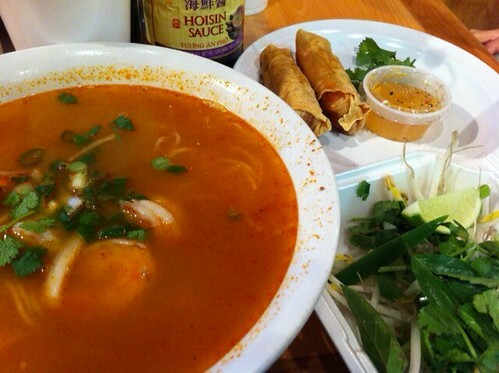 I had the Tom Yum Kung Pho. Christina has raved about this pho and I knew I had to have it too. The menu describes this bowl of noodle soup as having: Shrimp, rice vermicelli, lime, chicken broth, cilantro and green onion. Oh my goodness, it was just as good as Christina made it out to be! It was one GIANT bowl, that’s pho-sho 😉 I probably didn’t even finish a third of it. The menu says it’s spicy and they’re not kidding. But as long as you like spicy, you will be happy. I can’t wait to finish it off for lunch tomorrow!